Would you like to make a wonderful camera in just five minutes? This short exercise will help you to create your very own pinhole camera! Just follow the simple steps in this exercise and you will be able to see the world in a whole new way. Would you like to make a wonderful camera in just five minutes? Don't worry, it's easy to make and you'll have lots of fun. Plus you will be able to see everything (including your family) upside-down! Just follow the instructions below, and before you know it, you'll be looking at the world in a whole new way. Step 4: Now, it is important that no other light should be able to get into the tube. So, get some kitchen foil and wrap it along the tube. To do this, stick one edge of the foil to the side of the tube and wrap it around the tube at least twice. Then stick down the loose edge of the foil. Step 5: Now you have to be very careful. Get the drawing pin and pierce a hole in the centre of the shiny metal end of the Pringles tube. Viola!!! 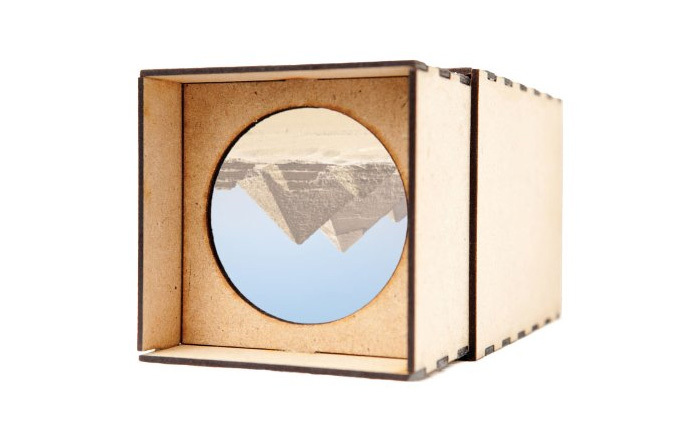 You now have your very own pinhole camera. Close one eye, and hold the open end of the tube to the other open eye. Go outside and enjoy the strange new world. What does the pinhole camera teach us? The pinhole camera was used by a scientist by the name of Ibn al-Haytham who lived from 965-1040 CE. He used the pinhole camera to prove several points including the fact that light travels in a straight line, and that vision is created by light travelling into our eye. This last point is very important as it disproved the ideas of philosophers such as Plato and Ptolemy who believed in the 'Emission Theory', i.e. that vision began in the eye and then travelled outward into the world.